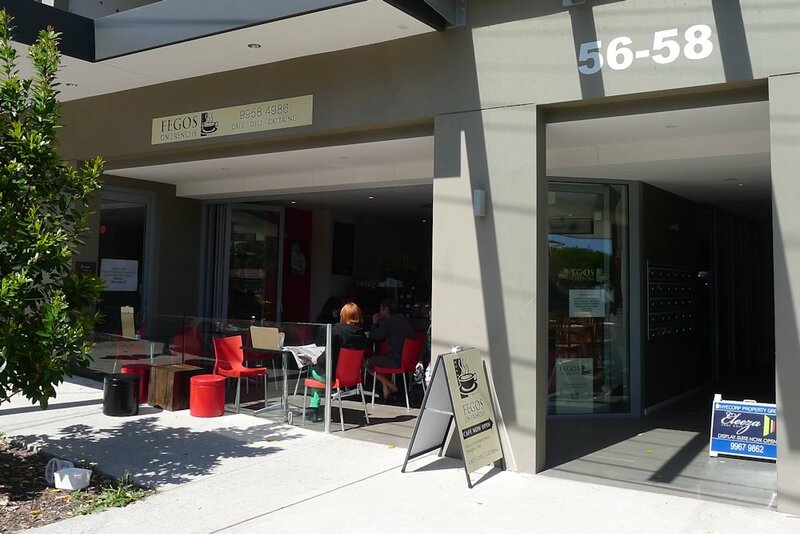 Nestled in suburban Willoughby, Fegos on Frenchs offers hot breakfasts served quickly in a relaxed atmosphere. It is a favourite amongst locals especially because it is pram and child friendly thanks to the spacious interior and collection of toys. They also offer child-sized portions of their dishes. Seating is plentiful and even on a Sunday morning (prime time for café visits) the crowd was not too large. Ordering and payment is done at the counter so you won’t feel rushed as you make your choices. The menu is quite extensive and contains something we haven’t seen before: a section at the back with a few healthy dishes with all of their carbohydrate, protein and fat contents laid out. For those who are in training, health freaks or simply interested in what the food contains, it’s a great idea! All coffees are available small ($3.50) or large ($4). No complaints from the coffee drinkers at our table and because they’re served fast, those who are getting takeaway don’t have to wait long. Smoothies ($6.50) are available with mixed berry, banana or mango. Unfortunately, my mango smoothie tasted predominantly of honey. While the texture was good, the balance of flavours was too one sided. 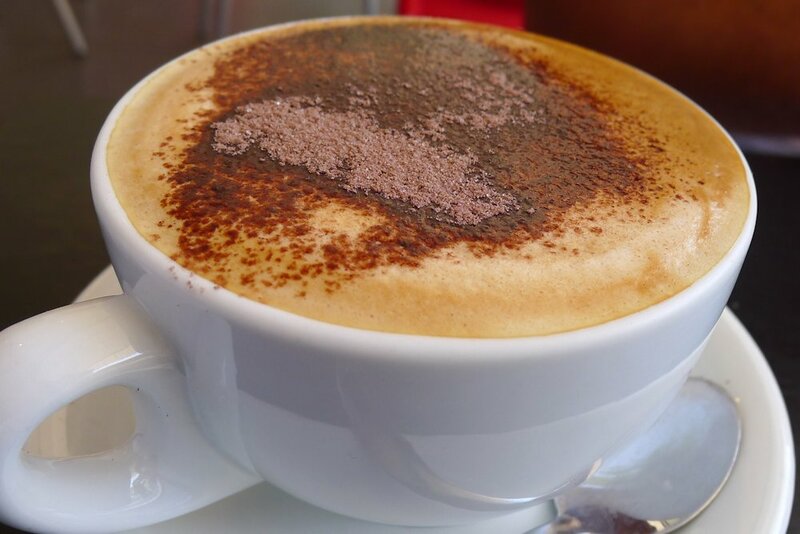 Beverages are rounded off by tea ($4.50 with a complimentary refill), iced chocolate, coffee or mocha ($6.50), milkshakes (small $3.50, large $5.50) and brand drinks from the fridge. From the “Something Healthy” menu we shared the fruit salad and yoghurt ($8.50) which comes with a passionfruit coulis poured over each. Muesli can be added for $2. Most of the fruit was comprised of watermelon but other fruits included orange, strawberries and grapes. 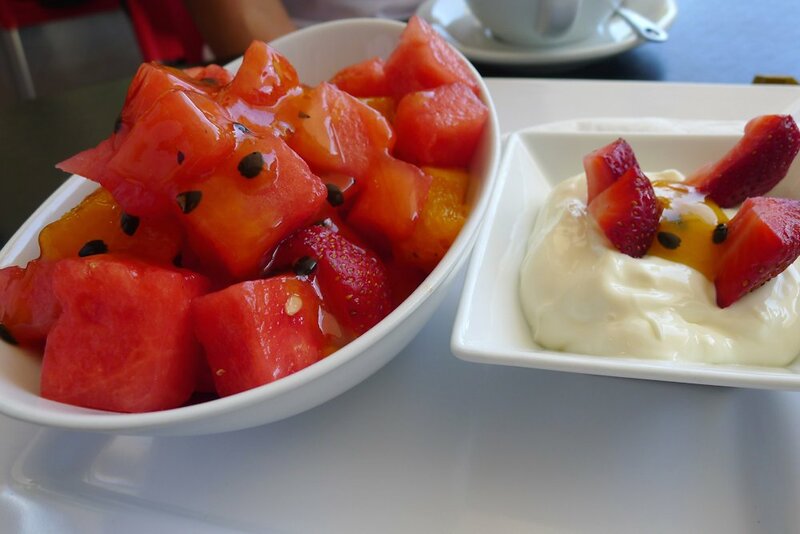 While the watermelon wasn’t as sweet as I was hoping, the coulis made up for it and the yoghurt was creamy and delicious. 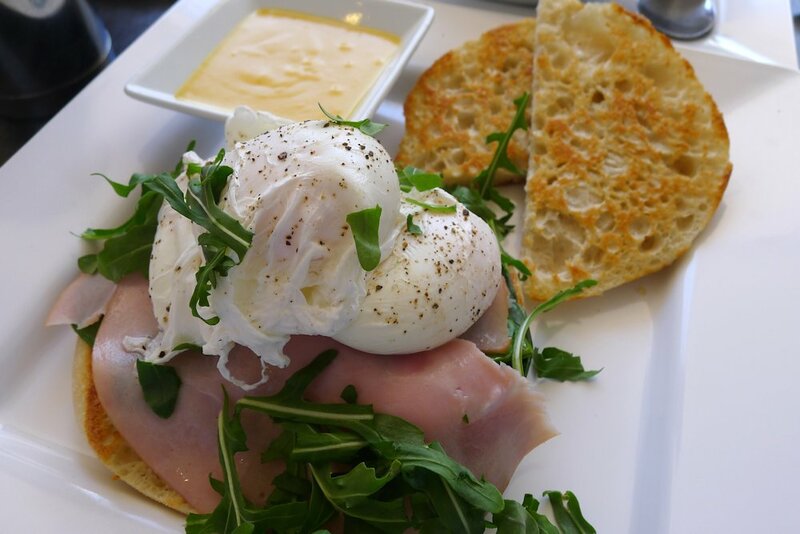 The Fegos eggs Benedict ($15) is served with three eggs and is available as a smoked salmon ($18) version. A mountainous plate, the Turkish bread served with this was very difficult to cut and again didn’t seem fresh. 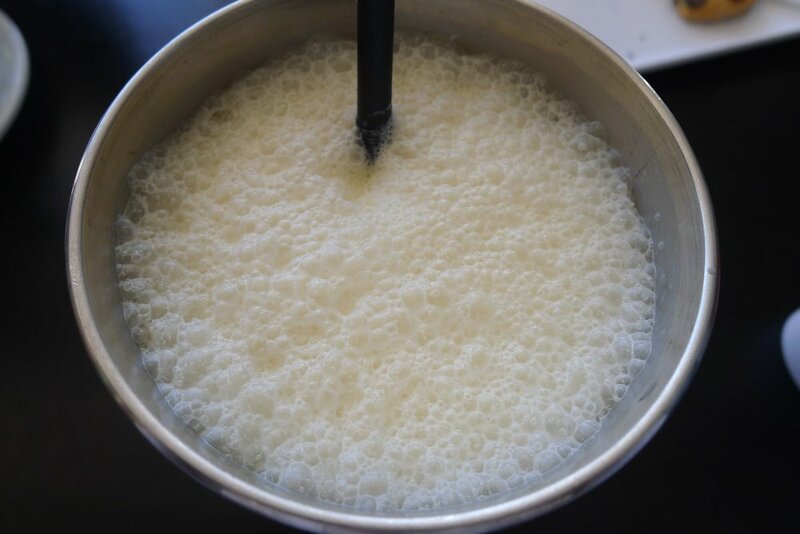 The eggs had been poached well and were still runny in the centre. They sat atop plenty of ham and a decent amount of spinach as well. Rocket over the top added some flavour depth and texture. The hollandaise was not as tangy as I prefer but overall a satisfying dish. 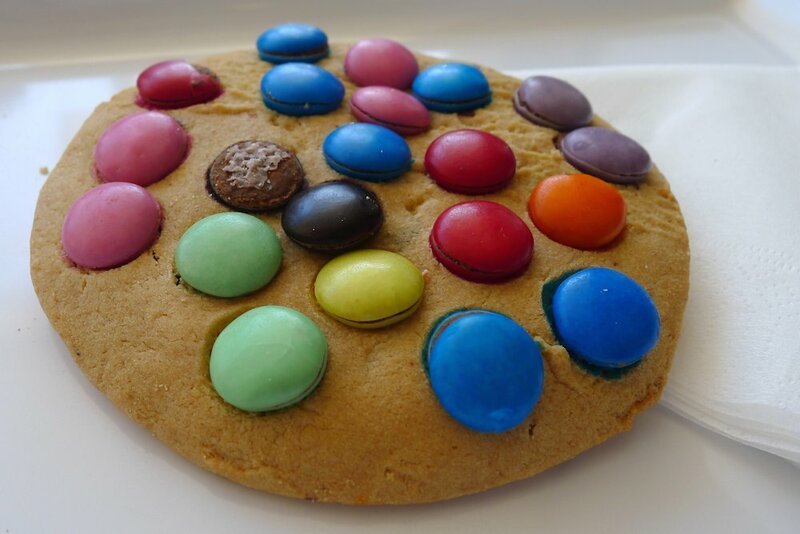 A Byron Bay cookie to round things off and we’re done! 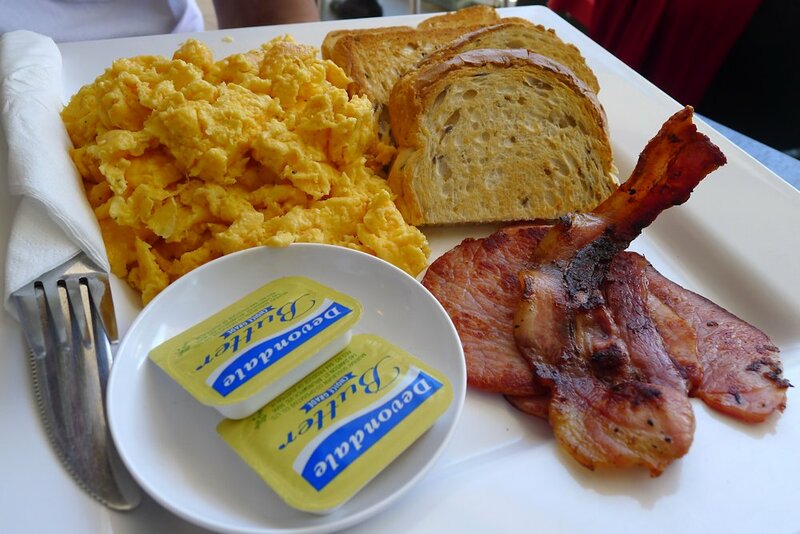 Other breakfast dishes include the jumbo omelette with three fillings ($15), bacon and egg roll ($8.50) and French toast or pancakes, each served with maple syrup and seasonal fruit ($10.50 each). Pies, sandwiches and quiches can be found in the glass counter and would satisfy those looking for a quick meal. While we found that Fegos on Frenchs is not as gourmet or service-focused as the top cafés we review, the atmosphere is relaxing and it’s a good place to wind down when you find yourself on the North Shore.